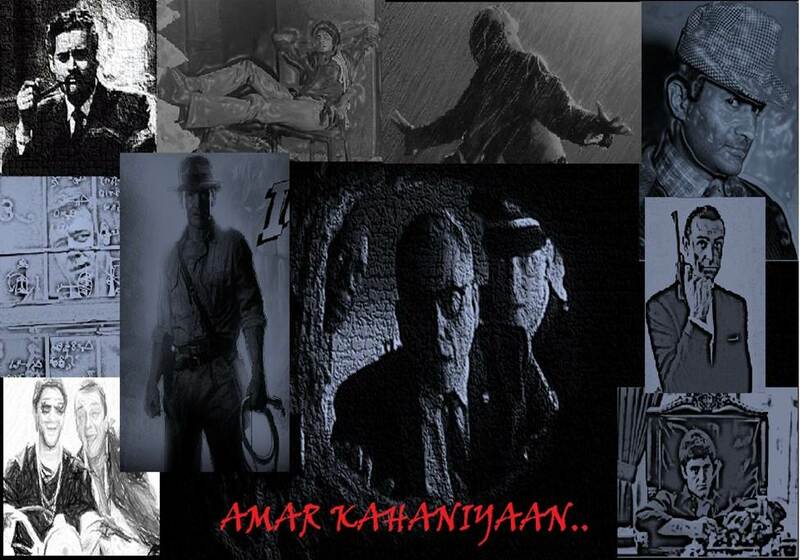 AMAR KAHANIYAAN: DEEWAAR - I'LL DIE FOR MY MAMA ! 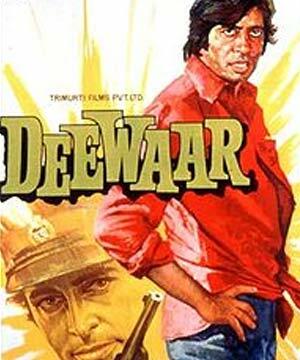 Deewaar, a movie who was an inspiration behind popularly known Slumdog Millionaire, Two brothers story. One running behind wealth, other honest and truthful. Infact Danny Boyle, the director of Slumdog, said that Deewaar is the absolutely key to Indian Cinema. And a movie with the same old formula of rags-to-riches though triumphed in the recession-prone western globe. But this Yash Copra-directed movie was a bigger and more deeper movie than the Slumdog any day. Deewaar is lesser the duel between two brothers, but it's more about the mother-son relationship and the clash of the practicality & idealism. And when it was released in overseas, it bear the title 'I'll Die for My Mama', which clearly justified the intent of this artwork, though a bit far-fetched and obscure for western audience. It was a phenomenal ground-breaking movie. It was way ahead of its time with superb and intense acting by one & all. And apart from script, the screenplay & dialogue were impeccable. No doubt Salim-Javed raised the value of script-writer at that period. Infact they were paid as high as the film heroes in their coming ventures. Movie starts in a flashback. 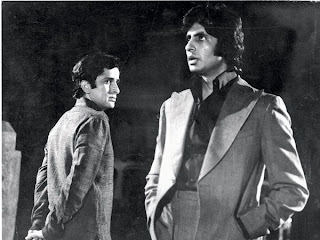 Two brothers, Vijay(Amitabh Bachchan) & Ravi Verma(Shashi Kapoor) had a tough and testing childhood. Their father who was a trade unionist got betrayed by the management of firm, and had to runaway from the infamous workers deal he was compelled to sign due to the blackmailing of corrupt businessman, who threatens to kill his family. He left his home due to shame after saving his family. But his acts became a deep wound in the heart of little Vijay when some angry workers who branded Vijay arms with words "My Father is a Thief". The family had to struggle on the streets of Mumbai afterwards. His wife has to do labor work under the lusty and exploited eyes of skyscrapers. Vijay use to counter not just every abuse against her mother, but he toiled hard to make his brother Ravi schooling done. He started as shoe-polishing young boy with a great self-pride. Who can forget the popular scene "Mai Phenke Hue Paise nahi uthata"(I don't pick thrown money). As they grew up, Vijay started working on ship dockyard and Ravi became a jobless well-qualified young man. Both of the brother faced different realities, they read different books of life. While Ravi school books taught him truth & idealism, Vijay's life-book was about the mad race to survive, it was about survival of fittest. And he gain power & rose to become the smuggler king-pin Dhabar Seth right-hand. Infact, he gain full hold of gang with his clever trickster-ship with Samant gang. He escaped death several times due to his dockyard days badge 786. Two epic scenes in his rising days were, one when he accept the offer of Dhabar Seth imagining his mother hardships, and the other when Dhabar Seth introduced childhood polisher truth to Jaichand. But then Ravi became Police inspector and Vijay forehead got more tenser lines. And finally the brother duel of truth-false, ethical-unethical started. The power of raising weapon against his own brother seems inspired from Geeta, Ravi felt helpless like Arjuna who has to fight his brothers. But he got the wisdom in form of a poor school teacher whose child got hurt from his bullet. He decided to take the case of Vijay Verma & Dhabar Seth. The popular signature scene still holds large eye-attention in different stage & stand up acts till date. Ravi left the Vijay's home with his mother. Vijay became alone and find solace in arms of Anita (Parveen Babi), a dancer he met in a bar. Ravi Verma became an intelligent and arduous police officer, and once he caught hold of 7-8 men of Dhabar with all consignment. And then Vijay's gang member demanded Ravi Verma's death, unknowingly pinching Vijay's brotherly heart. Vijay tried to convince Ravi to take transfer from the city with yet another iconic scene " Mere Paas Maa Hai", probably one of the most classy scene in history of Indian cinema. Vijay was misunderstood by every dear & near one except Anita. As Anita rightly described, Vijay was feeling down. First his brother left him, his mother got angry on him, his father found dead, and then his mother also get hospitalised which made him enter into his No-Go zone -Temple. He was about to abandon underworld & marry the pregnant Anita, when she got killed by Samant. Vijay took revenge from Samant and his people. One of the other iconic scene of the movie was beautifully shot temple scene. "Aaj Khush to bahut hoge tum" is remembered by one & all. After the final clash between the brothers, Vijay breath his last in his mother lap asking for forgiveness, while Ravi get awarded for pursuing justice. But the mere essence of the movie is the intense love for mother. Vijay did everything for his mother. He chose the wrong path but to make his mother and family happy. And he finally died for his mother. One scene in particular, which gives me goose-bumps every time I watch it, when Vijay bought the building as a gift for her mother, where she had once lifted bricks. 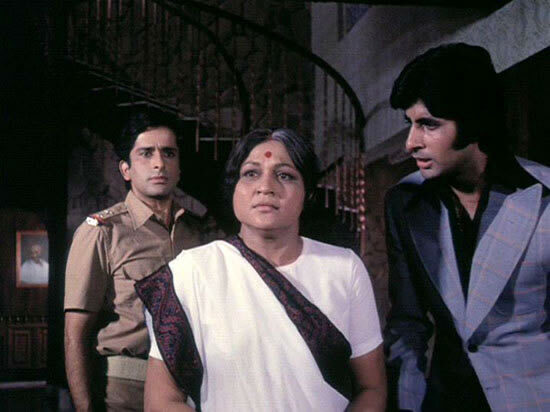 Mother played an integral part in Salim-Javed written scripts. 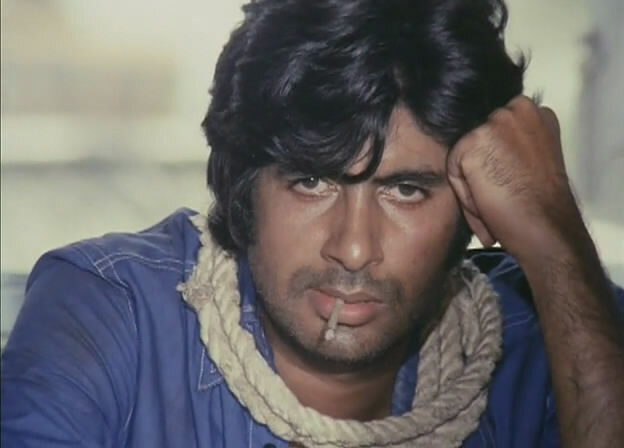 And Amitabh Bachchan established himself as the angry-young man of bollywood after this 70s blockbuster. The movie sweeps Six Filmfare awards except just one, Best Actor in Leading Role for which Amitabh was nominated. Surprisingly, his critically acclaimed role was left un-awarded while everybody attached with this film won numerous awards. This movie can really move anyone who is as attached to his mother as Vijay, I felt his pain, his struggles, his fight for- not right or wrong, but just one thing- MAA ! Nice post bro. but u didn't mentioned about the background score of the film which made the film a classic. but nice review. I SHOT MY WIFE. PROVE IT !